:Heather Williams walked through the desert of abuse, homelessness, poverty, and the loss of a child before she drank deeply from the oasis of faith. In her debut release, she tells her story of redemption in soaring vocals and sonic melodies. Includes "Hallelujah," "God Is Still God," "Breathe Again," "Holes," "Beautiful Thing," and the title track. 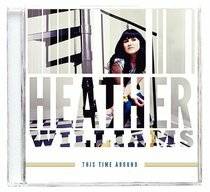 Singer / songwriter Heather Williams grew up in extreme poverty with her mom and stepfather. Throughout her early childhood, she suffered intense abuse. Her mother gave her away at age 11, and Williams went to live with her grandfather in Michigan. Living with little guidance and the pain of past abuse and rejection, Williams turned to drugs and alcohol as a way to numb the realities of life. As things began to spiral out of control, the young teenager began to have thoughts of suicide and was even homeless at one point. At age 18, however, the dangerous road Williams was on took a U-turn when she briefly reconnected with her birth father. Her father, a Christian, invited Williams to church. "When I was 18, I was going through a whole series of events where I was really rejecting God and blaming Him for everything that had taken place in my childhood," says Williams. "I came to this place where it was either, OK, I'm going to give my life to God, or I just don't know if I'm going to live. So, I walked up that aisle at that church, and I gave my life to God." Today, Williams is grateful for how far grace has brought her. She and her husband, a full-time youth pastor, live in Florida with their two young children. Her songs and her character speak of the strength of a woman well beyond her years, but Williams believes that the power of her testimony and the stories she tells through song will be used to encourage others, and that's all she's really concerned about. "I just want my life to be living proof that God can take anything, anyone and any situation and work it for good," she says. "He can take it and give you purpose and meaning in your life - He did it in my life, and I know He can do it for you."